My parents have had a garden ever since I can remember. It is usually a pretty big garden. I really don’t think they enjoy all the work, but they enjoy all the fresh vegetables they get from it. Growing up we always had to work in the garden. None of us enjoyed it, but it was part of our chores. My kids work in our garden at home all the time, but I thought it would be good for them to work in my parents’ garden. 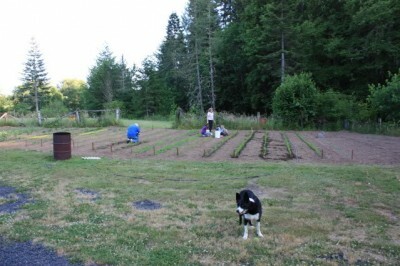 So, here they are on our recent trip to Oregon pulling weeds with my mom and dad. Yes, I made my kids work in my parents’ garden while we were on vacation. But my mom made it fun and she even paid them, which I will add she never did for us. Things sure change when you are a grandma. My kids may not have had enjoyed the work all that much, but one day they will look back and remember the day they worked with grandma and grandpa in the garden. One of the things that I was reminded of when I was in Oregon was how late the growing season is. Most of my garden is already finished. I have tomatoes, peppers, and a few zucchini, but besides that it is too hot for much else to grow now. My parents garden on the other hand is just starting to produce and their corn and tomatoes won’t be ready for another month or so. My plants are stressed from the Texas heat, but still producing. Enjoying delicious figs and purple bell peppers. My preschool class helps weed the school garden. Never too young to start! I’m always so jealous when I read other people’s blogs that don’t live here. I’m here in Oregon and other than lettuce (which we planted early) our first produce was today. I ate one cherry tomato and some green beans and pea pods which we threw in the stir fry. On the plus side, we will have tomatoes into late September or early October. Last year,we had tomatoes at Halloween. On the negative side, melons and peppers are hit and miss – if the particular summer is hot enough they will grow but if it is cool and rainy, not so much. The blackberries and blueberries are all coming on and veggie season will be in full swing soon.